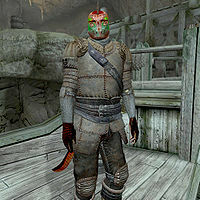 Yinz'r is an Argonian pirate who joins your crew after you have purchased six upgrades for Dunbarrow Cove. Once all Dunbarrow Cove upgrades have been purchased, he can be sent out with Scurvy John Hoff and Zedrick Green to pillage and plunder. Yinz'r wears a leather cuirass, a pair of leather boots and a pair of leather greaves. He wields a steel cutlass in combat. Dunbarrow Cove: Uncover a famous pirate's lost ship and claim it as your own. This page was last modified on 25 March 2018, at 03:19.